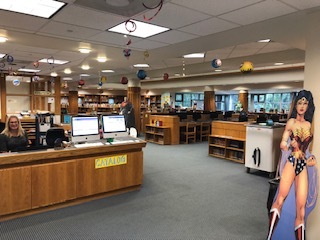 Accelerated Reader is a reading program for students in sixth and seventh grades at Kennett Middle School. It is designed to help them set and meet goals to improve or “accelerate” their reading skills in comprehension and fluency. The program also allows students to monitor their own progress while providing valuable data to the teachers that helps students achieve goals and ensures that students have materials within their own reading level. To make the program fun, a friendly competition is held each week within the sixth and seventh grades. 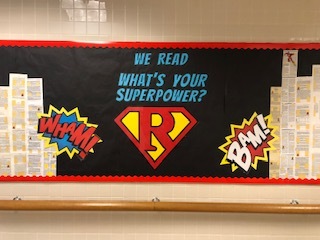 This year’s theme is superheroes, and the motto is “We Read…What’s Your Superpower?” The bulletin board display in the media center features tall buildings, one for each grade. 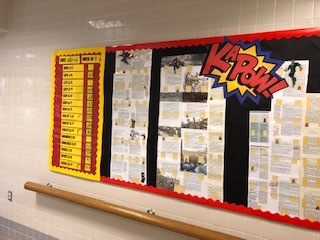 At the top of the building are superheroes, with the face of the teachers whose classes are in the lead on the superhero. Students enjoy seeing their class’s progress each week.